Norma’s funeral service will begin at 11:00 a.m. on Monday, January 28, 2019 in the Lutheran Church of Dell Rapids Chapel. Interment will be in the Colman Cemetery. Visitation with the family present will be from 2:00 - 4:00 p.m. on Sunday, January 27, 2019 at Kahler Funeral Home. Norma Alvina Stenberg was born to Carl and Pearl (Sundal) Opland on January 30, 1927 in Madison, SD. 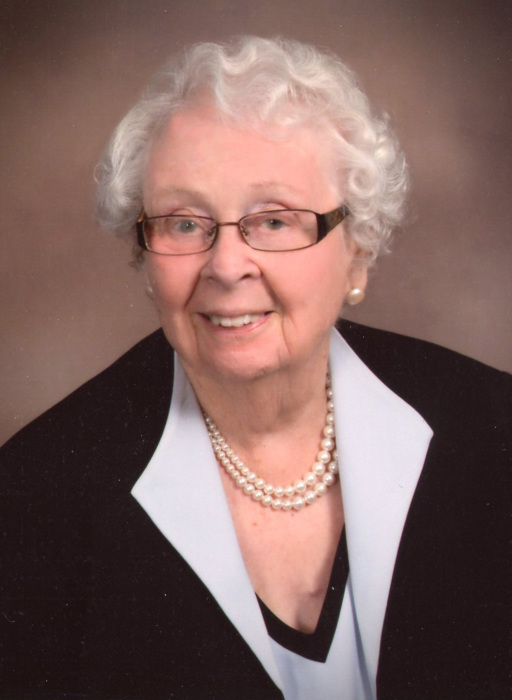 She passed away peacefully on Tuesday, January 22, 2019 at United Living Community in Brookings, SD. She was 91 years old. Norma lived on several farms while growing up in the Colton, Flandreau, and Dell Rapids communities. She graduated from Egan High School and married her husband of 68 years, Virgil Stenberg on December 24, 1945. They lived on a farm near Colman, SD, moved to Everett, WA for a few years and returned to settle on a farm near Lake Campbell (Volga, SD). In retirement they lived on a farm near Flandreau and then moved to Dell Rapids. They were members of Lake Campbell Lutheran Church, Flandreau Lutheran Church and the Lutheran Church of Dell Rapids. Norma worked at the Sears Roebuck store in Brookings, SD for many years as well as running a household full of active children. Her home was always warm and welcoming to anyone who stopped in and there always seemed to be good company, cake and coffee at hand. Norma will be remembered as a devoted wife and mother, who was always loving, kind and supportive to her children and family. She was a wonderfully attentive listener, advisor and a source of encouragement to the family. Her days were full of cooking, baking, cleaning, church activities, 4-H projects, farming duties, sewing ad many happy extended family dinners and card games. She will be dearly missed by friends and family, but we find peace in the good memories, speak of her often, and try to honor her in how we live our lives and love one another. Grateful for having shared her life are her children, Thomas (Germaine) Stenberg, Volga; Nancy (Ed) Morrison, Auburn, AL; Scott (Tawni) Stenberg, DeForest, WI; Kent (Kathy) Stenberg, Warrenton, MO, and her grandchildren, Colin Morrison (Joie Cannon), Goleta, CA; Elise Morrison (Broc Harzinski), San Francisco, CA; Anne Stenberg and Clark Stenberg, Volga, SD; brothers, Raymond Orlin (Linda) Opland and Rollin Dale (Amy) Opland along with many nieces and nephews. She is preceded in death by her husband, Virgil, daughter,Cheralyn Ann and brother, Marlo Opland. The family would like to thank the staff at United Living Community Nursing Home and the Brookings Hospice team for their compassionate care during Norma’s final days.